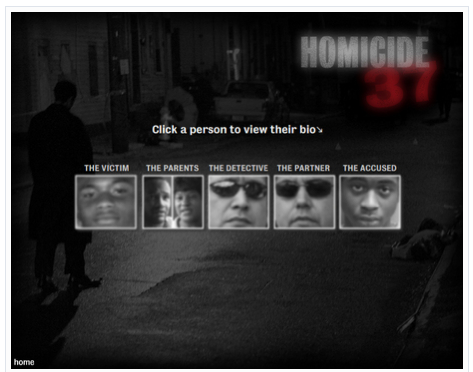 The final design of “Homicide 37” was dramatically different from the early storyboards. Smith said it was easy to modify and adapt the overall design because early storyboards helped establish a logical organization of the various parts of the story. This entry was posted on Thursday, January 19th, 2012 at 1:25 pm and is filed under MULTIMEDIA EXAMPLES, PACKAGES. You can follow any responses to this entry through the RSS 2.0 feed. You can leave a response, or trackback from your own site.